An installation by DAKU in Delhi’s Lodhi Colony will disappear on 15th May. If you happen to be passing through or driving around Lodhi Colony between the hours of 9.30am and 14.30pm this weekend, look for a seemingly innocuous white wall in Block No.8. Only within those hours, you can watch the wall transform into an installation by Delhi-based street artist DAKU, that quite literally changes with time. To the effect that come Sunday, it will cease to exist, returning only on 15th August. The date of its return hasn’t been chosen arbitrarily, and while it also happens to be Independence Day, that is purely coincidence. Instead, DAKU researched the sun’s movements, sundials and 3D technology, to understand how shadows would fall on the wall, and arrive at the exact dates and times when this installation would be visible. 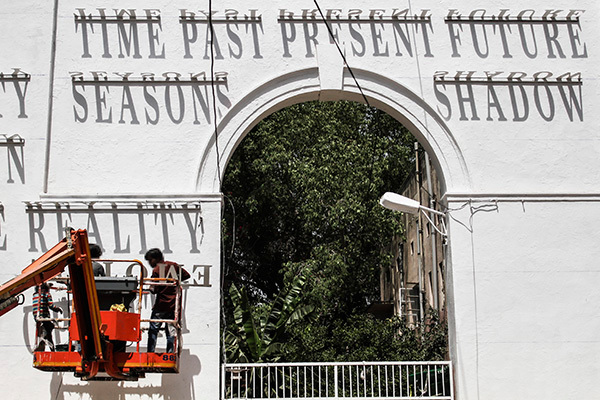 Time Changes Everything is one of many installations around Lodhi Colony, a group of government-owned buildings that set the stage for a year-long project by St+Art India Foundation to create India’s first dedicated arts district. To undertake such a public, urban intervention, rather than promote public vandalism, the Foundation has collaborated with the Central Public Works Department and the Delhi Urban Art Commission, and the Union government’s Swachh Bharat initiative. St+Art India has worked closely with local government bodies since its early days to gain sanctions and spaces to create their art. “This is as much for the residents as the visitors,” explains DAKU. The artist known as DAKU (he prefers to remain anonymous) has been an integral part of St+Art India Foundations efforts since it began in 2014. In the past, his works have been politically charged, but this time around, he chooses to take a more reflective approach. Although most of his work employs stencil and graffiti, modus operandi of the street artist, Time Changes Everything is devoid of colour. “At Lodhi [Colony], many of the international artists are primarily working with flat, colourful palettes. We tend to not pay much attention to shadows, they are mostly ignored, but a shadow is colour, it is a darker tone formed by light from the surface it is projected on,” explains DAKU. From 9.30am, you can watch a slew of words shift in and out of focus, morph in size and form, across this white expanse. Shadows are formed as sunlight passes through laser-cut frames, angled away from the wall at regular intervals. The combination of words, “ABILITY BALANCE ORDER CHAOS… …LOVE SIZE REALITY BEAUTY MIND BODY… PERCEPTION PEOPLE MEMORY DEFINITION…” seems random at first glance. “While it may seem bizarre to see all these words next to each other, one needs to focus on a single word and track how it changes in time.” Whether it’s People, Perception, Memory or Beauty, each is a concept that is ephemeral, characterised by continuous, inevitable change. Like the installation, which is never the same on any given day or time, these ideas are never constant. 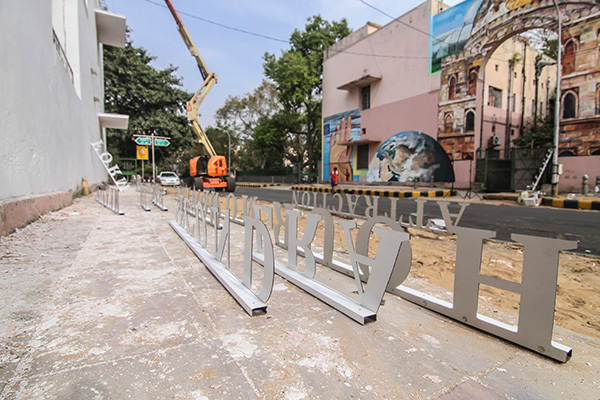 The installation’s transitory presence is a characteristic of all street art – However, while many of the walls at Lodhi Colony will vanish under a coat of whitewash over the coming months, in the case of Time Changes Everything, its fate lies in the hands of the changing path of the sun. The installation is visible until Sunday, 15th May and will return on 15th August.